Card Text Before Fight: Choose a creature. Gabos Longarms deals damage to that creature rather than the one it is fighting. 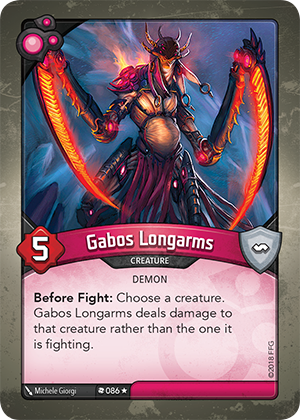 Can Gabos Longarms use its “Before Fight:” ability to damage creatures with the Elusive keyword? Yes. The Elusive keyword only stops damage that would be dealt by each creature’s power during a fight; damage dealt by keywords or other abilities still applies. Therefore, Gabos Longarms can redirect the damage using its “Before Fight:” ability to deal damage to an elusive creature, even if that creature has not been attacked this turn.